The primary complaint is radial sided wrist pain that radiates up the forearm with grasping or extension of the thumb. The pain has been described as a “constant aching, burning, pulling sensation." 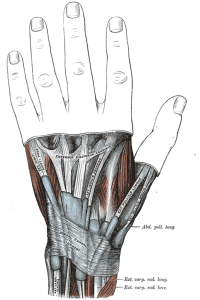 Pain is often aggravated by repetitive lifting, gripping, or twisting motions of the hand. Swelling in the anatomical snuff box, tenderness at the radial styloid process, decreased CMC abduction ROM of the 1st digit, palpable thickening of the extensor sheaths of the 1st dorsal compartment and crepitus of the tendons moving from the extensor sheath may be found upon examination. Other possible findings include weakness and paresthesia in the hand. Finkelstein’s diagnostic test will present positive provoking the patient’s symptoms. A scaphoid fracture most commonly occurs by a FOOSH in wrist extension and will present with radial sided wrist pain, tenderness and possible swelling in the anatomical snuff box, and limited ROM with pain especially at end ranges. If the patient presents with radial side wrist pain after a traumatic injury a scaphoid fracture must be ruled out. The superficial radial nerve supplies sensation to the dorsal surfaces of digits 1-2 and the first web space. The nerve can become compressed between the tendons of the extensor carpi radialis brevis and the brachioradialis, in developing scar tissue after trauma or by tight jewelry. Compression will cause ischemia resulting in numbness and tingling in this distribution. Compression on a spinal nerve root can cause sensory disturbances, myotomal weakness, and diminished reflexes throughout the root's distribution. The dermatomal keypoint for the C6 nerve root is the radial aspect of the 2nd metacarpal and index finger which is close to the area of pain experienced with De Quervain’s. Since a radiculopathy can present much like De Quervain’s a thorough screen of the cervical spine is necessary. Osteoarthritis of the 1st CMC typically occurs in individuals greater than 50 years old, and will most frequently present with morning stiffness of the 1st CMC joint, a general decrease in ROM of the joint, tenderness along the joint line, and a positive grind test. The goal in treating de Quervain's tendinitis is to relieve the pain caused by irritation and swelling. • Immobilizing your thumb and wrist with a splint or brace to help rest your tendons. Clinicians do not agree on frequency and duration of the splint; some think it should be worn continually for four to six weeks; others recommend wearing it only as needed for pain. The direct injection of a small dose of cortisone into each of the two tendons is highly effective, about 60 to 70% for the first incidence unless dealing with an “-its” type. Accurate positioning of the needle into each tendon should be confirmed by observing the needle movements as flexing the first MC joint passively moves the APL. After the APL has been injected, the needle is placed for injection into small EPB sheath, with confirmation done by passively flexing the thumb’s MP joint. Multiple case series and clinical trials ,  studied the Corticosteroid injections, often in combination with other modalities like NSAID’s and splints and have found a positive results from 62% up to 93%. Surgery is rare and is usually for those when non-surgical treatment has failed and the patient experiences persistent inflammation affecting his or her function. The goal of surgery is to open the dorsal compartment covering to make more room for the irritated tendons. The opening allows pressure relief of the tendons, to ultimately restore free tendon gliding. One study showed effective outcomes for compartmental reconstruction for De Quervain stenosing tenosynovitis. The surgical technique included lengthening of the first dorsal compartment with two incomplete parallel incisions in opposite directions. This technique allowed the compartment to not be completed disrupted and did not include sutures. The study reported that the advantages of the technique included simplicity of the surgery, restoration of normal anatomy, and prevention of complications (scarring, adhesions, and subluxation of tendons). The results reported 10 out of the 12 patients who were received the wrist operation demonstrated complete relief of symptoms.Despite the type of surgery patient should receive hand therapy post-operatively to restore motion and strength to promote function with daily activities. Postoperatively, the wrist is splinted in a neutral position until the skin sutures are removed. This will minimize the probability of tendon anterior subluxation. The prognosis for permanent recovery is excellent. Heat can help relax and loosen tight musculature, and ice can be used to help relieve inflammation of the extensor sheath. Stretching as explained above can be used to improve range of motion. Ice/Heat packs can relax tight musculature so that you can attain a bigger range of motion. Any of above stretching and strengthening exercises can be done as a home exercise program (HEP). Patients can also use ice and heat packs at home. After education, patients can perform self-massage techniques at home, and if chosen as the preferred intervention. There have not been any high quality studies examining the effects of conservative management as a standalone intervention. The vast majority of the literature focuses on corticosteroid and other injections in comparison to placebo. In studies where injections have been shown superior to splinting, the long-term outcomes were not examined. Viikari-Juntura E. Tenosynovitis, peritendinitis and the tennis elbow syndrome. Scand J Work Environ Health 1984;10(6):443-449. Walker MJ. Manual Physical Therapy Examination and Intervention of a Patient With Radial Wrist Pain: A Case Report. J Orthop Sports Phys Ther 2004:34(12). KANEKO, S., TAKASAKI, H., MAY, S., ‘Application of Mechanical Diagnosis and Therapy to a Patient Diagnosed with de Quervain’s Disease: A Case Study’, Journal of hand therapy, 2009. KNOBLOCH, K., GOHRITZ, A., SPIES, M., VOGT, M.P., ‘Neovascularisation in de Quervain’s disease of the wrist: novel combined therapy using sclerosing therapy with polidocanol and eccentric training of the forearms and wrists—a pilot report’, Springer, 2008. FOURNIER, K., BOURBONNAIS, D., BRAVO, G., ARSENAULT, J., HARRIS, P., GRAVEL, D., ‘Reliability and Validity of Pinch and Thumb Strength Measurements in de Quervain’s Disease’, Journal of hand therapy, 2006. ANDERSON, M., TICHENOR, C.J., ‘A Patient With De Quervain's Tenosynovitis: A Case Report Using an Australian Approach to Manual Therapy’, Physical therapy, 1994, nr 4, vol 74, p. 314 – 326. Effective management of DeQuervain’s tenosynovitis will involve a highly individualized, impairment driven approach for the patient in question. 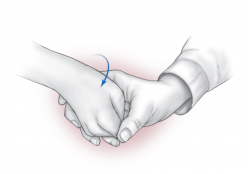 Early splinting during the acute phase will prevent aggravation of the tissues, and allow the patient to perform activities essential to self-care and employment. The patient will need to be educated on the tissue healing timetables, as well as why it is important to avoid activities that are aggravating to their symptoms. Once symptoms have decreased to the point that a splint is no longer necessary, the therapist will need to perform a thorough examination and evaluation to determine the residual effects from immobilization. Some losses in ROM may occur, and grade III-IV mobilizations of the radiocarpal, scapholunate, and 1st CMC joint would then be warranted. As the patient nears discharge, education should include a component on the importance of avoiding repetitive motions that could play an aggravating role, or potentially lead to a relapse of the condition. ↑ SCHUNKE, M., SCHULTE, E., SCHUMACHER, U., VOLL, M., WESKER, K., Prometheus, Bohn Stafleu van Loghum, Houten, 2005. ↑ 2.0 2.1 MEEUSEN, R., Praktijkgids pols- en handletsels, Kluwer editorial, Diegem, 1999. ↑ 4.0 4.1 4.2 4.3 4.4 Ashurst JV, Turco DA, Lieb BE. Tenosynovitis Caused by Texting: An Emerging Disease. JAOA 2010:110(5). ↑ 5.0 5.1 5.2 Harvard Women's Health Watch. Harvard Health Publications. Copyright 2010 by President and Fellows of Harvard College. www.healthharvard.edu. Accessed 11/27/11. ↑ 6.0 6.1 6.2 6.3 6.4 Gonzalez-Inglesias J, et al. Differential Diagnosis and Physical Therapy Management of a Patient With Radial Wrist Pain of 6 Months Duration: A Case Report. J Orthop Sports Phys Ther 2010:40(6). ↑ VAN DONGEN, L.M., PILON, J.H.J., Handboek voor handrevalidatie theorie en praktijk, Bohn Stafleu van Loghum, Houten/Mechelen, 2002. ↑ 12.0 12.1 12.2 12.3 12.4 12.5 Walker MJ. Manual Physical Therapy Examination and Intervention of a Patient With Radial Wrist Pain: A Case Report. J Orthop Sports Phys Ther 2004:34(12). ↑ Anderson M, Tichenor C. A Patient With De Quervain’s Tenosynovitis: A Case Report Using an Australian Approach to Manual Therapy. Phys Ther 1994:74(4). ↑ Linscheid R, Dobyns J. Dynamic Carpal Instability. Keio J Med 2002:51(3). ↑ 16.0 16.1 16.2 Wainner RS, Irrgang JJ, Delitto A. Reliability and Diagnostic Accuracy of the Clinical Examination and Patient Self-Report Measures for Cervical Radiculopathy. Spine 2003:28(1). ↑ Gummesson C., Ward M.M., Atroshi I. The shortened disabilities of the arm, shoulder and hand questionnaire (Quick DASH): validity and reliability based on responses within the full-length DASH. BMC Musculoskeletal Disorders. 2006; 7(44): 1-7. ↑ Horn KK, Jennings S, Richardson G, et al. The Patient-Specific Functional Scale: psychometric, clinimetrics, and application as a clinical outcome measure. Graduate, School of Physiotherapy, University of Otago, New Zealand. 2010. ↑ Hajder E., The role of ultrasound-guided triamcinolone injection in the treatment of de Quervain’s disease: treatment and diagnostic tool?, Chirurgie de la main, 2013, vol.6, p. 403-7,( level of evidence: 2B). ↑ Kume K., In de Quervain’s with a separate EPB compartment, ultrasound-guided steroid injection is more effective than a clinical injection technique: a prospective open-label study, Journal of hand surgery European volume, 2012, vol. 6, p.523-7,( level of evindence: 1B). ↑ 29.0 29.1 Kang H.J., Endoscopic versus open release in patients with de Quervain’s tenosynovitis: a randomized trial, The bone and joint journal, 2013, vol. 7, p. 947-51,( level of evidence: 1A). ↑ El Rassi G, Bleton R, Laporte D. Compartmental reconstruction for de Quervain stenosing tenosynovitis. Scandanavian Journal of Plastic and Reconstructive Surgery and Hand Surgery [serial online]. 2006;40(1):46-8. ↑ Peters-Veluthamaningal C, van der Windt DAWM, Winters JC, Meyboom-de Jong B. Corticosteroid injection for de Quervain’s tenosynovitis. Cochrane Database of Systematic Reviews 2009, Issue 3. ↑ Viikari-Juntura E. Tenosynovitis, peritendinitis and the tennis elbow syndrome. Scand J Work Environ Health 1984;10(6):443-449.